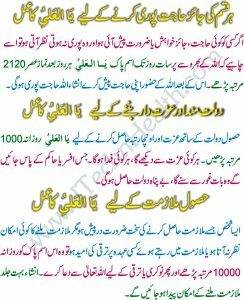 According to hadish there is a 99 names of Allah Pak. According to Islamic rules, a Muslim men kind may not be given any of the 99 names of Allah in exactly the same name of Allah Pak. For example, nobody may be named Al-Aziz (The Almighty), but may be named Aziz (almighty). This is because of the belief that Allah is almighty, and no human being is the equivalent of Allah Pak, and no human being will ever be the equivalent of Allah. Muslims are allowed to use the 99 names of Allah Pak for themselves but should not put ‘Al’ at the front of them. He who recitation this Name regularly and keep it with him after writing it on a piece of paper will attain high rank, afflunce and success in his (lawful) desires. Frequent recitation of this name helps in destiny and in Traveling. Jo shaks iss ism kee tilawat karey agar faqeer ho to maaldaar ho jaye gareeb ul watan ho to watan wapisi ka saman ho jaye. Iss Ism ka naqash pehnay aur vird karey to aisey ajeeb o gareeb asraat muratab houn ky khud heraan reh jaye agar hakim badshah ha ya lashkar o rayaya ya itatat mn sir tasleem khaam kar dey jiski shadi na hoti ho iss ism kee barkat sey jald shadi ho.